Every year millions of people around the world are forced from their homes by conflict, persecution and poverty. A small proportion of these seek safety and a better life in Europe. Every year hundreds of people die trying to reach Europe’s shores crossing the Mediterranean Sea. 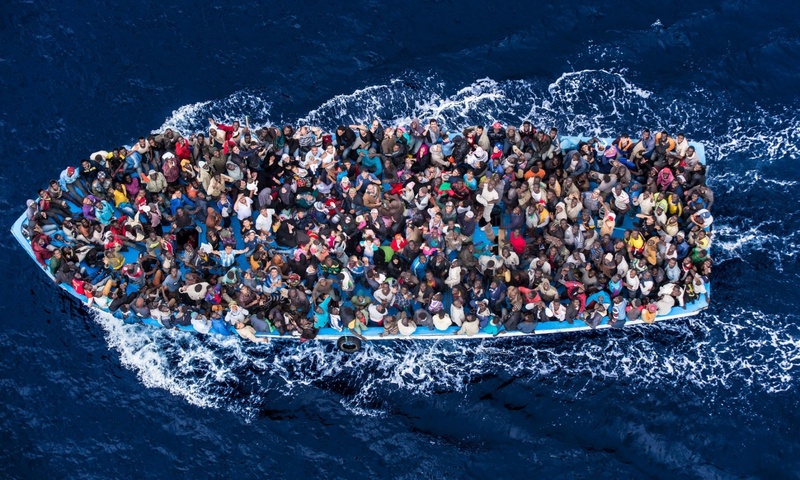 339 people were drowned close to the Italian coast on one day in February this year. Many were sisters and brothers. The youngest was 12 years old. But the UK Government said last October that it would no longer support any search and rescue operations for refugees at sea in the Mediterranean. More than 3400 people died attempting the crossing in 2014. Around 150,000 people have been rescued by the service which has been withdrawn. Now, the European Union, including the UK, have a ‘policy’ described by many as “Let Them Drown”. This will lead to the Mediterranean Sea becoming a mass grave. This is immoral. The UK Government claims that saving people from drowning in the Mediterranean encourages them to make the journey but why do people risk everything to try to reach Europe? Many people are escaping the terrible war in Syria, where 1 in every 6 people has left the country. Some are Palestinians fleeing from Israeli destruction in Gaza. Some come from Eritrea where people are forced into slave labour (sometimes for western mining companies) for years. People from Sudan are escaping a dictatorship guilty of genocide. Already in 2015 60% more people than in the same period last year have crossed the Mediterranean, in winter seas, looking for safety in Europe. Letting people drown or building higher fences won’t stop people seeking safety. As Amnesty International say: “European Union member states must stop burying their heads in the sand whilst hundreds keep dying at sea”. Tuesday 17th March. Meet at the bottom of the Moor 12.15. March to Town Hall for a rally at 1pm then to the Home Office at Vulcan House S3 8NU for 2pm.